TGI Friday’s Mozzarella Cheese Sticks are a classic appetizer that have been served up at TGI Friday’s for a long time. Now you can recreate this recipe at home. Going out for dinner so often means having that extra special treat with your meal. This recipe was requested by readers just like yourself. I think that the TGI Friday’s Mozzarella Cheese Sticks are extra special because the breading is thick and flavorful. So here is my version of this recipe. You will need to buy mozzarella cheese from the grocery store, but don’t use the buffalo style, because it will be too soft. Buy the cheese in the brick and it will work just fine. Be sure to serve this one up with your favorite marinara sauce. For this recipe you can use any type of vegetable oil. Peanut oil is my personal preference, but I have used canola, vegetable oil, corn oil, and sun flower oil all with good results. If you don’t have a deep fryer you can use a 2 quart pot, simply add enough oil to your pot has about three inches of oil. When frying only fry a couple of cheese sticks at a time. This will keep the oil from cooling off too much. If the oil cools off too much the cheese sticks will absorb oil and become greasy. Be sure to check out these other favorites from TGI Fridays. 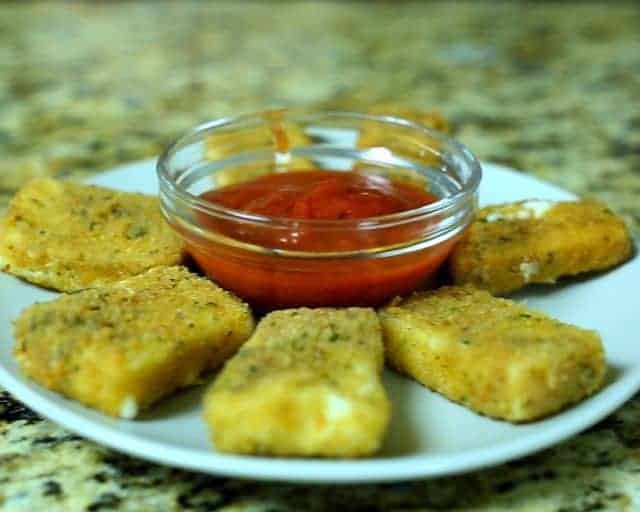 Mozzarella cheese sticks are one of the most popular appetizers out there. You can enjoy these from TGI Fridays at home. Cut cheese sticks into long slices approximately 3/8 inch thick. Blend together the flour and cornstarch in a bowl. Place cheese plank into the flour, then dip into a bowl of whole milk and then dip the cheese stick into the breadcrumbs. Shake off excess breadcrumbs and place mozzarella stick on a wire rack. Discard the flour. Repeat until all cheese sticks have been dipped once. When all of the cheese sticks have been dipped once place back into milk, then into bread crumbs for the second time, and shake off the bread crumbs. Dip all cheese sticks into bread crumbs for the second time. Preheat vegetable oil to 350 for frying. Drop cheese stick into hot oil and fry until golden brown. This should take no longer than 1 minute. Remove cheese stick from oil and place on a wire rack to cool. Serve with your favorite marinara sauce. I tried these out and they came out wonderfully. The only thing is that I added some egg to make some sort of egg/milk mixture. Thanks!! I’m glad this is a recipe for the original Friday’s cheese sticks. Please don’t change it. Friday’s uses a different recipe now and it’s awful. They’ve added Asiago cheese. It’s been that way for over a year, maybe longer. I don’t know anyone who likes the new ones judging from web comments. So thanks for leaving this original recipe here please! Can I leave the fried cheese stick to a party and leave it for long time and consume? Will it taste still good even is cold? They will be ok, not the best way to do it, but perhaps you can heat them a little just before serving. Ours were a disaster! Didn’t taste anything like the TGI ones and we followed your recipe 🙁 they were v disappointing and just bluergh! I just made some and was upset as well they melted in the oil and look a Mess . I am sorry you had a hard time with this recipe. These don’t take very long to fry. It is very important to make sure the coating dries for a moment or two before placing these into the oil. Can you make a video for Fridays sizzling chicken and shrimp…? Why do you use milk instead of eggs to add the bread to the mozzarellas? Is any difference between using one or the another? They do result in a different texture in the batter. I felt milk was the better choice here, I believe it results in a coating that doesn’t “fluff” up as much as what I think egg can. Thank you for your request. I do not have this recipe at this time. I appreciate your suggestion. Yes, 1 very hungry person, or 4 not so hungry people. Don’t you refrigerate the coated cheese sticks to keep them from melting too fast? I did not, I think with the double coating it works out well. I did not chill for the video, and you can see when I made jalapeno poppers live, and in the video similar batter technique got me very similar results. I think they are fine since they are double coated. I used the same technique for my jalapeno poppers.